A definition – Pan-Africanism is a dynamic concept of seeing Africa [and its populations] as one entity in its different components: people, cultures, history, and issues without ignoring the underlying diversity of these varied aspects, and considering Africans as one race wherever they are in time and space. In January 2011 Muammar Qaddafi convened in Tripoli an international conference where he invited Africans from all over the world, the Pacific, Australia, Latin America, North America, Caribbean islands, Africa, Asia and Europe to reflect on improving their well being where they live and contributing to Africa development. This was one of many expressions of a Pan-African spirit. Pan-Africanism has been a movement against imperialism in all its forms and for the liberation of Black Africans from the evils of Black enslavement and colonialism, and from the racism these produced. Context – During the history of human civilizations, as far back one can go, for example under the Egyptian pharaohs’ era, Africans have tried to resist against external invaders interested in their valuable resources, people and minerals and other commodities. Their resistance was some times more successful than others. By 525 BC, white Persians had conquered Black Egypt; by 640 AD white Arabs had conquered Egypt; and by the 15th century white Europeans had began raiding Africa for black captives to enslave. By 1900, White European invaders had overrun Black Africa. Actors – Pan Africanism formally started in 1897. A London-based Trinidadian lawyer Henry Sylvester-Williams organised the first ever Pan-African Association. A few years later in 1900, the first Pan-African Conference was held in London under the leadership of the same Sylvester-Williams. Dr. W.E.B. Du Bois who was to become the torchbearer of pan-Africanism for the next three decades attended. Different other Pan-African Conferences followed respectively in Paris , in London , in London , New York , Manchester , Dar es Salaam  and Kampala . The 5th Pan-African Conference held in Manchester was to be considered significant as it initiated a determined strong aspiration for African emancipation from colonialism. Organised by the Trinidadian influential George Padmore and Nkwame Nkrumah from Ghana, it registered the participation of Jomo Kenyatta of Kenya, Hastings Banda of Malawi, American scholar W. E. B. Du Bois, prominent Jamaican barrister Dudley Thompson and Obafemi Awolowo and Jaja Wachuku from Nigeria. 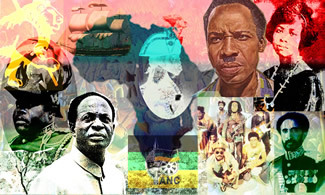 Achievements – In the 50s and early 60s, across the African continent, a new group of Pan-Africanists arose amongst the nationalists: Sékou Ahmed Touré from Guinea Conakry, Ahmed Ben Bella from Algeria, Julius Nyerere from Tanzania, Amilcar Cabral from Guinea Bissau, and Patrice Lumumba from the Democratic Republic of Congo, became more resolute to get their respective countries to total liberation. Kwame Nkrumah and Jomo Kenyatta should also be included on the list. The majority of African countries gained their political independence in the 60s. But in many cases this has come to be seen as only a change of delegation of political and administrative responsibilities from colonials to indigenous leaders. Policies [ACP/EU, IMF, WB, aid, etc] and structures in place [false democracy, corruption, etc] in many countries attest to that. After the 60s, the pan-Africanism flame faded away. Only a few names merit to be mentioned: Muammar Kaddafi [yes, despite the negative image mainstream elite in the West gives of him], Thomas Sankara and Robert Mugabe. The CRITICAL question today about Pan-Africanism is its relevancy. Looking back at its origins and objectives, it was established to liberate Africans from mental and physical occupation, oppression and restore their dignity. Has the movement performed successfully so far on these different fronts and or achieved any of its prior motivations? The answer is a resounding NO. Globalisation – Do imperialism, [or what is commonly themed as neo liberalism], racism and disrespect of Black people still prevail today? I think they do. Examples: 1) Wars in Libya, Ivory Coast, Democratic Republic of Congo, Sudan, etc 2) High level of unemployment among black people in the West or their proportion in prisons’ populations 3) Has racism ended? Where it seems invisible, it expresses itself differently, for example under the form of indifference. But how do the mechanisms and structures which yesterday justified the establishment of pan-Africanism operate in today globalised context? What are they or who are the actors? Actors – They include UN, UNSC, and affiliated institutions, IMF, WB and other similar entities active in regulating and influencing finances and economies around the globe through a panoply of mechanisms which rarely work at the benefit of Africans, either on their mother continent or in the Diaspora. Most of these institutions emerged particularly or were strengthened at the end of WW2 without any input of their today’s African victims. In the first era of colonialism, the power of capitalism was not as strong as it is today. Colonising countries used capitalists for their political objectives of controlling vast zones of influence. In the current globalised context, multinationals whose financial might is far beyond national budgets of many sizeable African countries, have been using/ lobbying their respective governments to get richer [more profits for their shareholders] without any care for the victims of their greedy [and sometime criminal] pursuits. Western multinationals or predators and their governments cannot do it alone. Like at the time of slavery, using the old principle of “divide and rule,” these entities have on the ground their accomplices, some African leaders who are operating on their behalf to loot minerals resources, dispossess their compatriots of land, and in some cases kill them so a never ending accumulation of wealth by capitalists can be achieved. Africa has been at the core of human civilization, if Africans want it badly to be again, it can. It is up to them. Such step will get Africans to better standards of harmonious living. The potential is impressively there. 40 African Challengers with different sizes and spread in African countries, but the majority being South Africans, which where making revenues of between $350 million and $80 billion a year. The critical question: who is benefiting from that African economic potential? Strategies – Lack of Unity has failed Africans so far. Without it, Africa is destined to miss its chance to play a greater role at world stage. Divide and Rule is still the strongest principle used by externally interested parties. o Political Integration – The way forward seems to be Federalism where countries would agree on continental wide policies in certain areas, leaving each national community to care for their own societal particularities. Will there be a continental government? Difficult to imagine as where things stand today or in a near future. But a pressure from the grass roots movements, if well organised, could gear towards such outcome. o Common Security – African High Command; this has been one of the central ideas of Pan African forefathers and particularly Kwame Nkrumah. Without a unified command to protect Africa, there will always be external interference. The strategy is to mortgage the continent’s wealth and all countries with important contributions in the funding to have critical roles in the management and deployment of the African force, but interventions across the continent to be politically decided at AU levels. Though AU needs too to become less politically and financially dependent of external influences. African Union [AU] and other actors – In the last couple of years, AU has decided on the need to establish and set criteria for increasing presence and participation of the Diaspora in AU programs and policies in a systematic and global manner through the African Union Commission rather than in a piecemeal and uncoordinated fashion through various structures and Organs of the AU. Other actors constitute the multitude of African oriented organisations operating either in the Diaspora or on the continent trying to address the mentioned challenges faced by African people. Legacy projects: these are initiatives established at the Global African Diaspora Summit in May 2012 held in South Africa and aimed at tapping into the potential contribution that African Diaspora can play in the development of the continent. This entry was posted in Africa and tagged Ahmed Sekou Toure, Amilcar Cabral, Georges Padmore, Jomo Kenyatta, Julius Nyerere, Kwame Nkrumah, Muammar Kaddafi, Pan Africanism, Patrice Lumumba, Robert Mugabe, Thomas Sankara, WEB Du Bois. Bookmark the permalink. Reblogged this on Caught between the words of my soul.